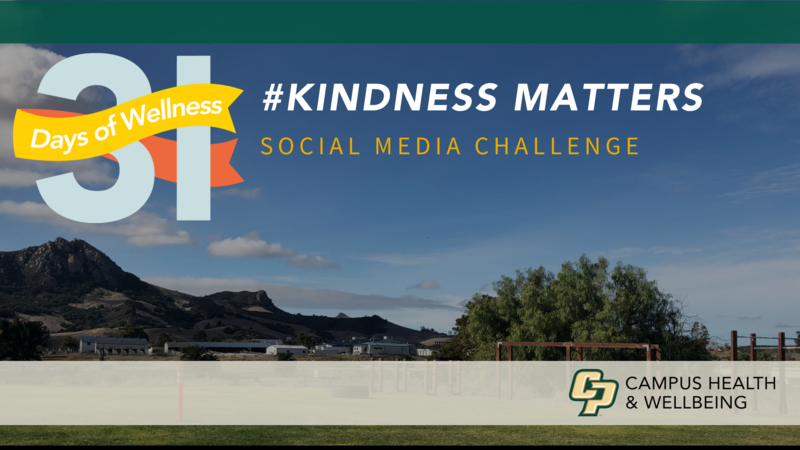 For the month of May, Campus Health and Wellbeing is sponsoring a social media Kindness Challenge. We are basing the challenge off of the idea of random acts of kindness! Some participants may be wondering what a random act of kindness is and what they can do to carry out one. Random acts of kindness are small, kind, selfless gestures meant to positively affect others. These gestures can be carried out for friends, family, acquaintances, or even strangers! According to randomactsofkindness.org, just witnessing a random act of kindness produces oxytocin, also known as the “love hormone.” This results in uplifted moods, increased self-esteem, and lowered blood pressure. Random acts of kindness benefit the giver, the receiver, and anyone else who observes it. It also has the possibility of activating a “pay it forward” mentality! There are thousands and thousands of possibilities for acts of kindness! You can get as creative, or as simple, as you’d like! In terms of the challenge, we are asking participants to take a picture and share it to instagram with a short story of what their act of kindness was. Participants can tag @mycpwell. We will choose winners for various prizes at the end of each week. …and if you’re looking for some extra inspiration, here is a video about the power of handing out a flower in the name of kindness!